Mokuleia Classic Hawaiian-Style Beachfront Home - Great Views! For either inquiry option, please include info. about your expected visit (number in group, ages of babies/children, any questions), and we will respond to you! WELCOME to your comfortable, peaceful retreat in Paradise! Beauty surrounds you. The view from the living room itself is marvelous: beautiful Ocean waves and grassy Lawn, Hawaiian coconut trees with blue sky and white clouds. You can sit and look at it all day! ~ large picture-window OCEAN view, plus all the benefits of a regular home! BEACH - Just walk out the door, thru the lanai with the picnic tables, and you will be on your grassy lawn (big enough for Croquet! ), surrounded by native Hawaiian plantings, and the gently sloping seashore is in front of you. VIEW - See the sandy beach, the ocean's waves - plus! - the coastline and mountain views. Beautiful! Lay down and sunbathe, either on the tree-shaded grass or sand, and let go in the warmth of the day, listening to the waves lapping on the shore. Or sit in a chair and just be mesmerized by the ocean's beauty. Stay long enough and you will see the turtles! (and maybe the humpback whales during winter). SWIM/SNORKEL - After taking a refreshing swim or snorkel in the warm and safe ocean, return to your home, enter either bathroom's shower from its outside door, enjoy your hot shower, and step directly from the shower into the bathroom to get dressed. KITCHEN - Stay casual and prepare dinner in the full kitchen. The kitchen has a pass-through to the dining/living room - easy for communicating and also from which to enjoy the picture window ocean view. You could even go out to the lanai and grill your own fish or teriyaki steak or fresh vegetables. Eat outside at the double picnic tables or in at the big family-sized dining table - your choice! BEDROOMS - Two bedrooms plus living room will accommodate up to eight people. 2nd - Second floor bedroom: two sets of stationary bunk beds, each bunk pair in its own small private bedroom area, in the partially-divided upstairs bedroom. Another GREAT place to sleep is on the Queen bed in the living room (used both to sleep and as a Hawaiian daybed, the 'pune'e' for those in the know!). This comfortable bed has the advantage of a picture window lawn/ocean view when you wake up, and soothing ocean sounds at night! Two bathrooms make this a comfortable retreat for a family or friends to enjoy. HOUSE - The house is an original, vintage, roomy, Hawaiian style, classic board and batten, unique beach house, built circa 1920s-1940s. My grandparents said it first started life as a fishing shack! In this house we enjoy Hawaii's trade winds, with open windows, & six ceiling fans that cool the house, with extra standing fans too. Our beach home was built to have a bedroom for the parents and a bedroom for the kids, so we added the extra queen bed in the living room for those who enjoy informal, casual, beach-side living! This Hawaiian beach house has been well-used and well-loved within this family since the 1930s! Many improvements have been made over the years, and especially the past three years. And we would like to share it with you now. CONVENIENT - The nearby towns of Waialua and Haleiwa are just ten minutes away with many restaurants, shops and attractions available! The beautiful North Shore coast and ocean are in either direction. PEACEFUL - When you stay here, in the quiet of the night, go outside, look up at the star-filled sky, and notice how peaceful it is. It is QUIET. Listen to the waves, they will lull you to sleep in your clean and cozy beds - all is well with the world, and in the morning you will happily greet another beautiful day! This beach house has been in our family for over EIGHTY years! Our grandparents, parents, the siblings, and now children and grandchildren have had many memorable and fun times here. And we are ready and willing to share this vintage beach house with you now! We have a family history and much aloha for Mokuleia and the Waialua district. It is reflected in our stories, experiences, the house itself, and the furnishings and plantings. This truly is a vintage, classic beach house, and there are fewer and fewer of them remaining in Hawai'i! This is no modern cookie cutter house, flat and starkly new - this house is unique, with home-grown vernacular architecture and has soul! And it has seen its share of natural phenomenon, and keeps on ticking! Come relax ocean-side in a real home-like beach house, just perfect for a family to feel comfortable in! We love the openness of the living and dining rooms, comfy and casual, with the fabulous view out the picture window! I especially like the Queen bed in the living room, used as a Hawaiian-style daybed/pune'e, where you can wake up to the morning view of trees, blue sky and ocean. It's a room that just embraces everyone in a big family hug! There is also an easy five-stair 'upstairs' where the second bedroom and second bathroom are located, adding both some privacy and still some connection to the rest of the house, overlooking the dining area. Main bathroom is 4-piece: has a separate shower and a separate bathtub, toilet and sink/vanity, recently updated. Upstairs bathroom has a shower (with two shower heads), toilet and sink/vanity, recently updated. BOTH Bathrooms have unique, original, custom, solid doors, that exit from the shower to the outside! Peaceful, secluded, natural beach. Shallow entrance and swimming area, good for kids! O'ahu's tallest mountain, Mt. Ka'ala, is just out our kitchen windows. Wide reef, breaks up large waves, good for snorkeling, pretty waves! 2016 - New large top-loading LG. Pantry: variety of herbs and spices, salts and peppers, usually Olive oil and vinegars, other staples will vary. Fridge: usually many condiments in fridge, like catsup, mustard, jam, shoyu etc. Our Kitchen is an actual separate room of the house, 'the kitchen,' and adjoins the dining area. It has a sink, stove/oven, fridge, pots/pans, dishes & utensils, extras - with both a mountain and an ocean view! Hawaiian palms, large lawn, and tropical and native plants. Variety of snorkeling gear, body boards, inflatables, "noodles." Flat from roadside into house, to lanai, onto grass to the edge of the tropical lawn, overlooking the beach, ocean and coastline -- very convenient. Handholds in the separate tub and in the shower stall. 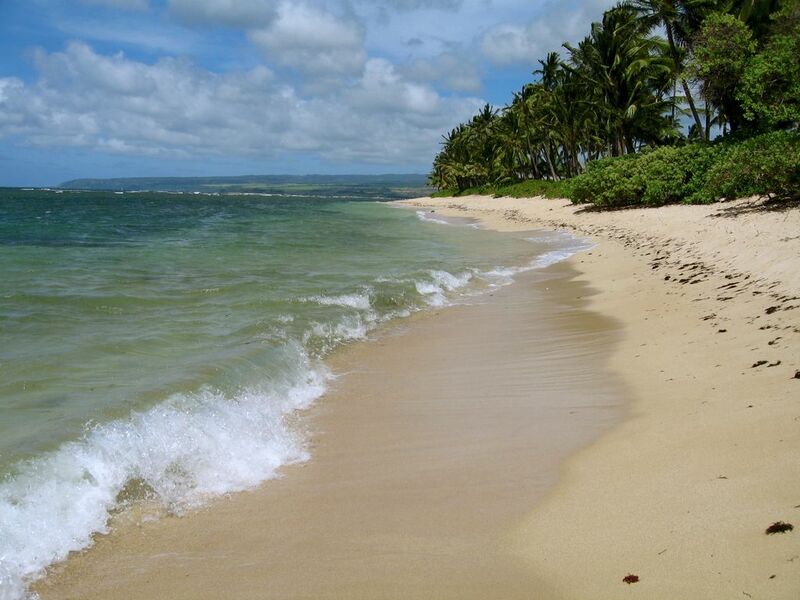 Beautiful sandy oceanfront, with wonderful views of the North Shore up and down the beach, protected by wide reef - good for snorkeling, safe for swimming throughout the year, and shallow enough for children to wade, play and swim in - a quiet area, few on the beach. Turtles visit often, whales may be seen during the winter months. Beautiful summer sunsets - magnificent winter waves from storms elsewhere! The lawn is grassy and has lots of shade - good for watching the waves, daydreaming, playing games, and even star-gazing. The living room picture window provides a fabulous view of the grass, plantings and OCEAN. Can be seen from the kitchen, thru to the dining-living room. A Favorite place to spend the night is on the Queen bed in the living room - wake up to the sight of the trees and lawn with ocean waves! Beautiful and wonderful place to stay with a million dollar view! Our family of four (two adults and two teens) spent seven days enjoying the quite north shore. Walked the beach every day making memories while viewing the sunsets, turtles, whales, and swimming in the amazing Hawaiian waters. The famous north shore town of Haleiwa is close by and visited by many. This Hawaiian style beach home was welcoming, clean, and had everything we needed (amenities were as listed and in good condition). The WiFi was speedy and strong (which our teens listed as their #1 favorite amenity). Stephanie was enjoyable to work with and responsive. She is truly invested in ensuring her guest's stays are without issue. Thank You! We hope to return someday and recommend the Mokuleia Classic Hawaiian Beachfront Home! Our family of five had a wonderful time at this vintagey beach house! The crashing waves, no people and whale/turtle watching suited us perfectly. The house was old but fixed up nicely and fit the feel of "yesterday's" Hawaii. It wasn't a great swimming beach but the view was incredible and the walks down the beach were perfect. The owner was very involved with the check in and check out procedures, which we were not use to - it took up a fair amount of time. She is very thorough about all the rules...it seemed a bit much. That being said she obviously puts in a lot of time and effort making the house inviting with welcome gifts, flowers, etc. We will always remember our time there as being our very best family vacation so far! Great views and Comfortable, cozy home away from home. Wonderful beachfront cottage in quiet neighborhood. Owner has thought of everything to make our stay comfortable and ready to take advantage of all the north shore has to offer. House is spacious, private, and stocked with quality kitchen supplies, cookware and linens. Waialua’s Saturday farmer’s market was well stocked with fresh veggies and other foods. Good shops, restaurants and grocery store just a few minutes drive to Haliewa. Location of this property was convenient to other north shore beaches, Dole Plantation, Waiamea Valley and Kaena Point. Great stay in a spacious, comfortable home in a nice area. We had an amazing time here! Thank you Stephanie for sharing your beautiful property with us. We wanted a more private, beach side, setting and this is exactly what we got. The house was very well appointed with everything we needed. Our party of 5 was extremely comfortable there and the location was amazing. The beach was quiet even at high season. We were entertained by breaching whales, surfers offshore and turtles on the beach. The location was beautiful and close enough to Haleiwa to quickly run into town if we needed any supplies. Stephanie was responsive and very helpful with anything we needed and even came and brought us a Christmas surprise. Thank you once again for an extremely memorable stay! We absolutely loved it! We spent Thanksgiving at this beach home and found everything we needed to be at home and comfortable. The first night our arrival was late (after10pm) and Stephanie the owner was on hand to greet us and share information about the house and area. This was appreciated and had never happened on any of our prior VRBO rentals. Stephanie also stayed in touch during our time in her families home she even brought us a pie for our Thanksgiving dinner!! The house is older ( it belonged to her grandparents) but well supplied and decorated tastefully to maintain its country charm. We found plenty of kitchen items, beach gear that we were encouraged to use and super soft linens!! Games, kid items, books for rainy days everything we could have needed was available. We had a pesky chicken come by quite often and made use of the broom to run it off several times! During our stay the North Shore experinced some of the biggest waves for years 30-45 ft swells! That was something to see, but did prevent accessing the beach for about 3 days! Bummer! If you are looking to get away from crowds and truly relax then this is the place to be. We would definitely return to this lovely country home. not quite fully as expected. Lovely view and location beach but not great for swimming or snorkeling. Rooster and chicken everywhere which were noisy. Glider Rides, Skydiving, Kite Surfing, Farmers' markets, Horse Rides, and Polo & Whale-Watching (in season). At the house we have Croquet, Beach Chairs and Beach Towels, and Boogie boards, kick boards, snorkeling equipment and floating 'noodles.' We also have jigsaw puzzles, board games, and a variety of general fiction and non-fiction books for adults and children, including Hawaiiana books, for your enjoyment. Stocked with kitchen basics, including spices, coffee filters, foil, plastic wrap, small coolers etc. Hair dryer, iron and ironing board in the house too. As they say - 'just bring your toothbrush!' - and a swim suit!